Our Lady of Victory maintains a traditional liturgical music program for masses, with the “sacred treasure” of historical Catholic music at its heart. Weekend liturgies feature the chanting of the Mass Ordinary in Latin and traditional hymns, led by our fine cantors and choir, along with solo and choral music from the 16th century to the present day. In devotion to our Patroness, a seasonal Marian Antiphon or the Ave Maria is sung before mass begins, either plainchant or in a choral setting. Click here for the Catholic Courier's photos from the Feast of Our Lady of Victory’s 150th Anniversary Mass. 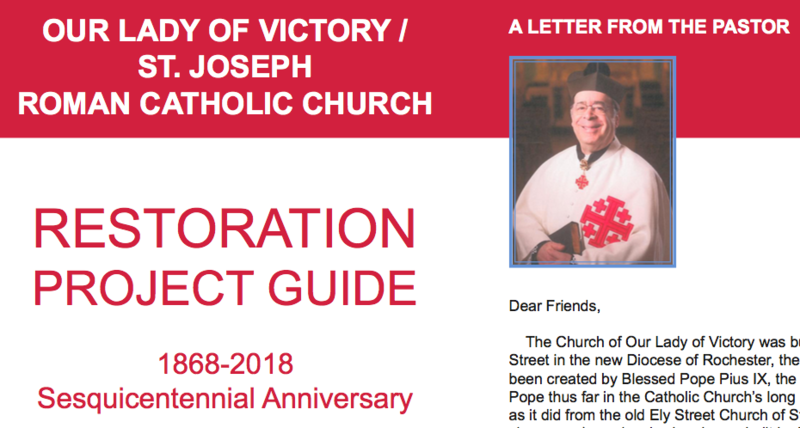 Click here for the Restoration Project Guide (PDF). Contributions may be made online safely and securely using a third party service. These contrtibuions may be setup as a one-time donation or as recurring payments. Just click the button below.